The injured bald eagle that disrupted service on Metro's Blue and Silver lines Wednesday evening in Maryland couldn't be saved. Find out what wildlife experts know about it. The injured bald eagle that disrupted service on Metro’s Blue and Silver lines Wednesday evening in Landover, Maryland, couldn’t be saved. “The wing bone [was] simply shattered and in pieces,” said Jim Monsma, director of City Wildlife, where the bird was taken for care, on Thursday. 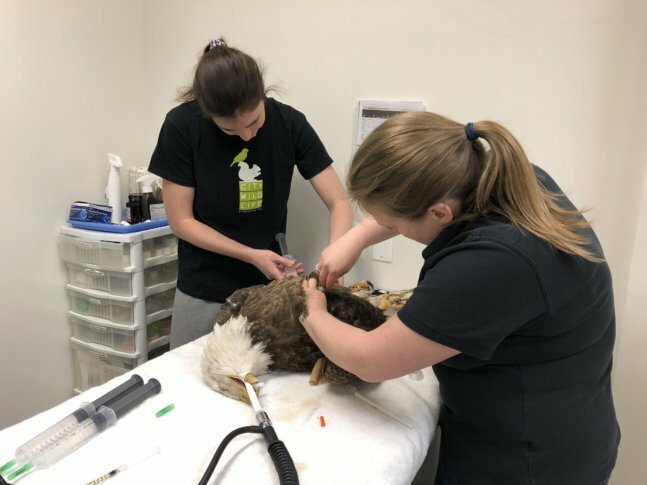 X-rays of the bird’s injured wing were sent to wildlife veterinarians around the country Thursday morning; they all agreed it could not be saved. “They put their heads together and the opinion was unanimous, though sad, that this was not a break that could be repaired in such a way that the eagle would fly again,” Monsma said. The bird’s large size suggests it was female; its coloring indicates it was much younger than the breeding pairs whose nests are shown on local webcams. The euthanized bird was about to enter its first breeding season. “It still had some dark markings on the beak and on the head and on the tail. It still had actually some of its juvenile, immature feathers, so it hadn’t fully molted into a full adult yet,” said biologist Dan Rauch with the D.C. Department of Energy and the Environment. Monsma said the bird’s remains will be given to federal officials, who will collect and send the feathers to Native American tribes for ceremonial uses. Dedicated nest-watchers might want to bookmark the local eagle cams now. It’s certainly been a drama-filled season for the region’s bald eagles — from rejected and new suitors and abandoned eggs, to the rescue of the injured bird that Metro accommodated by single-tracking operations for hours between the Morgan Boulevard and Addison Road stations on the Blue and Silver lines. Rauch added Thursday that he spotted the first osprey to return to the city, another sign of the renewed vibrancy of the local ecosystem. The birds migrate each year and winter in South America. Osprey have nests all along the Anacostia River. “They usually arrive almost every year on March 15, so it’s a day early. But we’ll take it,” Rauch said.